It’s “What We’re Playing Monday”! Maximum video games! I already talked a little bit about Crysis 3’s multiplayer during the beta, and for the full release my impressions are pretty much the same. Crytek fixed the aim-down-sight issue, but I still just can’t manage to get a good round in. The single-player of Crysis 3, on the other hand, I’ve been enjoying quite a bit. Set twenty years after the events of Crysis 2, you journey back to a ruined New York as the nano-suited entity known as “Prophet”. A lot is made of what has become of your humanity during the twenty years you’ve been in the nano-suit and whether or not you’re human anymore. Prophet himself isn’t sure, either, constantly stating that he’s sacrificed a lot to battle the alien Ceph. Shortly after the opening segments in which returning character Psycho busts you out of a CELL containment unit, you’re given Crysis 3’s new weapon, the one that all the pre-release materials made a big deal of: the Predator bow. While being able to stay cloaked even after shooting off an arrow is pretty cool, the bow unfortunately unbalances Crysis 3 a little too much in favor of the player. While this might sound OK to some, using the bow extensively takes away a lot of the challenge, especially if you’re diligent in picking up spent arrows from your dispatched foes. It’s a one-hit kill against almost all enemies and comes with a variety of other arrows, like explosive and electric-tipped, to deal with other threats. With the appropriate nano-suit upgrades for enhanced stealth mode, you can basically become a hidden Grim Reaper, picking off one target after another. I’ve found it more enjoyable to just engage enemies in straight-up firefights and use the other nano-suit modes to gain an advantage. I did the stealth route for a while, but after my third or fourth encounter of not being detected, I decided I needed a little bit of a challenge. The game is, of course, absolutely stunning on the PC, although we kind of expect that from Crytek games by now. Fans of the original Crysis’ more open approach to level design will be pleased because Crysis 3 brings this back allowing players to find their own way around larger battlefields. Even though the bow throws the whole game’s balance out of whack, going back to the more traditional Crysis style with guns and suit modes is great fun. Has anyone else been playing Crysis 3? What do you think? I’ve never really understood the appeal of the Crysis series beyond its visuals. Both the shooting and the story have seemed subpar to me, so I never got into it. It’s interesting that they chose to unbalance the game a bit with the bow, especially as I’ve never really thought of Crysis as a stealth game. Was this a big departure all of a sudden? Just because I’m curious: if you could rate the games best to worst, what order would they stack in? 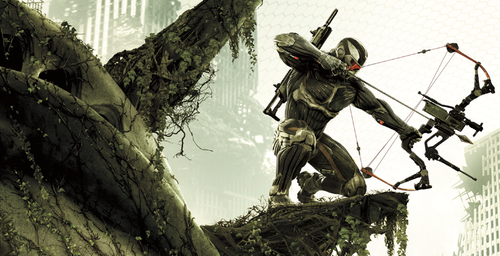 Crysis 1 was fantastic, because it was still linear, but the environments were wide open. You were hardly ever forced into corridors. You got to experiment. It’s heavily reminiscent of their spiritual predecessor, Far Cry (which Ubi has the rights to now), in which you had a linear path but wide open spaces and an emphasis on utilizing that open space. In Crysis, if one tactic was getting you killed, you had ample space and resources to try another approach. I haven’t played the other two, but 1 (and the Warhead expansion) were amazing, and have aged so well. The story is kind of dumb, though. But that’s to be expected from Crytek. I’ve never played the Crysis series, but I’ve always marveled at it’s visuals. Even with the first the testament still stands for those who have good PCs, “Can it run Crysis?” That shows how insane of a game it is, mechanically speaking. I’ve seen bits and pieces of Crysis 3’s single player and it’s a bit of a generalized kind of sci-fi story but I didn’t find myself in dislike of it. I may pick it up at some point, but that still remains to be certain.